From Hogmanay (New Year’s Eve) to Burns Day (a celebration of the work of poet Robert Burns), the Scottish are certainly no strangers to a good party. But everything can’t be about parties, so what better way to celebrate a special occasion than with an exquisite piece of crewelwork? That’s exactly what Phillipa Turnbull of The Crewelwork Company thought when the engagement of Britain’s Prince Harry and America’s Meghan Markle was announced. “They are such a lovely couple. I wanted to design a piece that would commemorate their marriage,” she told me. 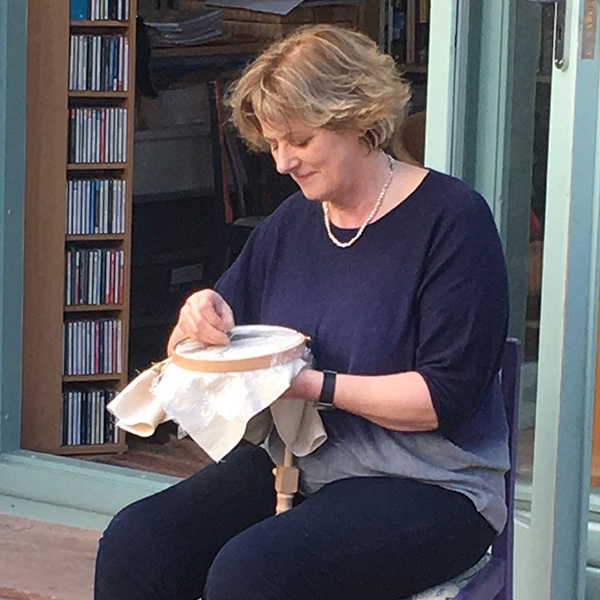 Phillipa’s crewelwork designs are based on the original needlework she finds in the British castles and country houses that she has spent her career exploring. 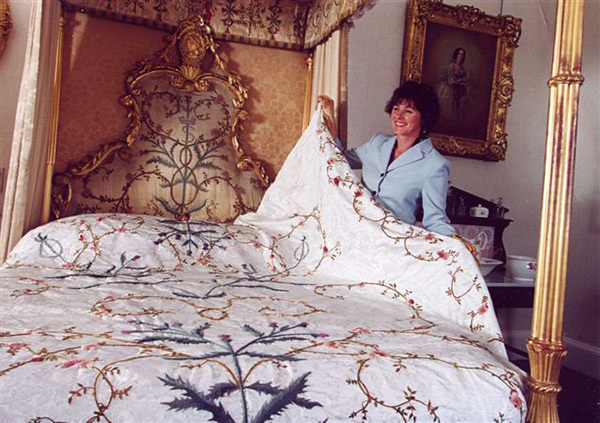 Thanks to the work she has undertaken at Glamis Castle in Angus, Scotland, the ancestral home of HRH The Queen Mother, Phillipa was able to draw on her knowledge of the embroidered motifs found on the bedhead, hangings, and bedspread in The Queen Mother’s Bedchamber for her pillow design. Phillipa and her recreation of The Queen Mother’s bedspread. Photo courtesy of Glamis Castle, Glamis, Angus, Scotland. The bedhead was embroidered by The Queen Mother’s mother, Cecilia, the Countess of Strathmore. Cecilia, extremely creative and a brilliant embroiderer and designer, produced ten much-loved children. On the marriage of her ninth child, Elizabeth, to the then Duke of York (who later became King George VI on the abdication of his brother), she gave her daughter and son-in-law a set of apartments in Glamis Castle and these very special bed hangings. Unfortunately, the bedspread was lost, and for many years, the bed was covered with a patchwork bedspread. That changed in 2000 when Cecilia’s great-nephew, the Earl of Kinghorne and Strathmore, commissioned Phillipa to re-create a bedspread for The Queen Mother’s bed. 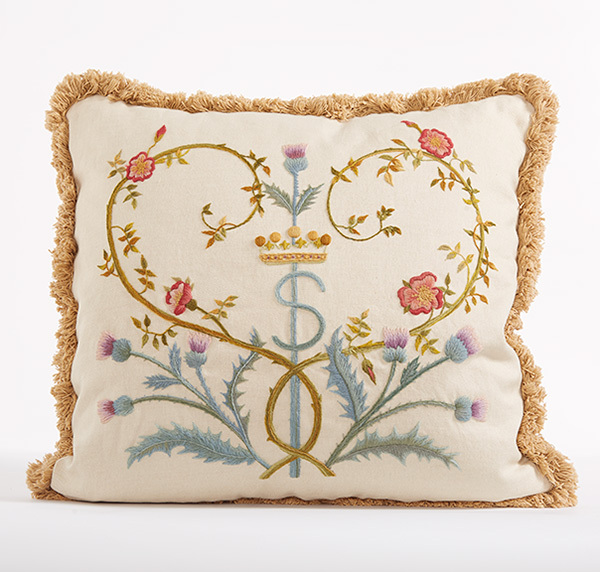 Phillipa’s crewelwork pillow commemorating the May 19, 2018, wedding of Prince Harry and Meghan Markle. Photo courtesy of The Crewelwork Company. The embroidery in the pillow replicates historic Scottish crewelwork stitches and techniques as worked during the Arts and Crafts movement. These stitches are: closed fly, crewel stem, satin, padded satin, French knots, pistil, and long and short as “soft shading.” Phillipa’s pillow design is available as a kit, and she is currently stitching the design for The Royal Wedding Stitch-a-Long. Stitchers who are embroidering the kits have been invited to join in the stitch-a-long by posting their progress on her website (www.crewelwork.com) or by emailing the photos to them. The stitch-a-long has become a very interactive event as Phillipa uploads regular blogs to show the progress that she’s making and also to demonstrate the techniques used. Phillipa stitching. Photo courtesy of The Crewelwork Company. The Strathmore family is very happy to know that Cecilia’s designs are appreciated by both visitors to the castle and those re-creating her beautiful needlework in far-away lands. This new pillow could end up at Glamis Castle with the work of Cecilia whose work provided the inspiration for Phillipa’s design. P.S. I first met Phillipa Turnbull at Glamis Castle when I was writing an article about her work on the bedspread about twenty years ago. It was a freezing cold day in February, and the castle car park was covered in thick ice, so we slid and tottered across the car park trying our best not to fall. The castle was not open to the public at that time of year, so there was no heating. Phillipa had been to the castle a number of times before so she was well prepared for the freezing temperatures, and I took a number of photographs of her fitting the bedspread wearing thick gloves and a big fur hat! I wasn’t quite so well prepared, but it still felt very special (cold—but special!) to be allowed private access to the castle. Kathy Troup, born in the north of England, has lived in Scotland for many years. She edited a U.K.-published stitching magazine for seventeen years and continues to write about the subjects she loves. To learn more about The Royal Wedding Stitch-a-Long, visit www.crewelwork.com. 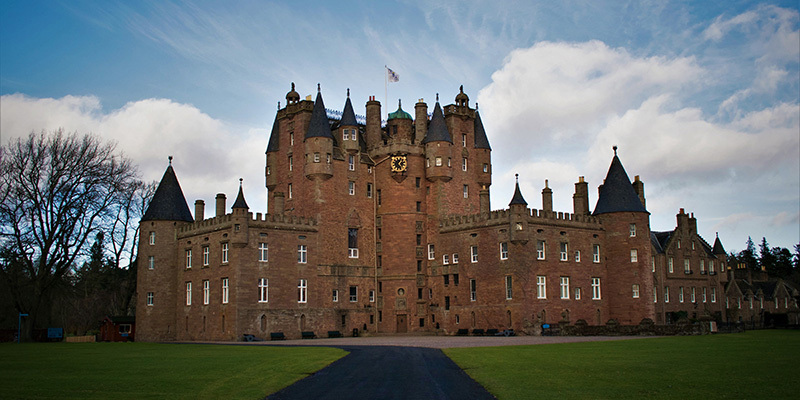 For information on Glamis Castle, visit www.glamis-castle.co.uk. Are you new to crewelwork? Learn how to create this fabulous needlework in the book Beginner’s Guide to Crewelwork Embroidery: 33 Stitches and Techniques for Crewelwork and discover more embroidery stitches in our Stitch in Time blog series. Read the article Phillipa cowrote with her daughter, Laura Turnbull, “A Treasure Trove: The Textiles at Muncaster Castle” in PieceWork’s July/August 2016 issue. Read the entire “Postcards from Scotland” series! Featured Image: Glamis Castle. Photo courtesy of Glamis Castle.